Sometimes things happen due to dumb luck. On our way to Tasting Plates Ultimate Desserts, we spotted something completely strange on 5th Ave. 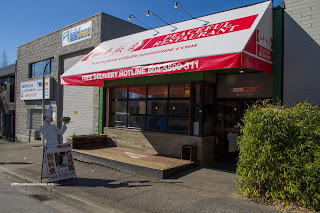 Occupying the former location of Benkei was a brand spanking new location of Peaceful Restaurant. Yes, the same one that was featured on Triple D's. With that in the back of our minds, we returned there for an early dinner after downing copious amounts of sweets. Upon walking into the place, we noticed that the original crew (father and daughter) were manning this new location. Apparently this will serve as the "main kitchen" which will supply the other locations (yup, another one is on its way in Kits...). 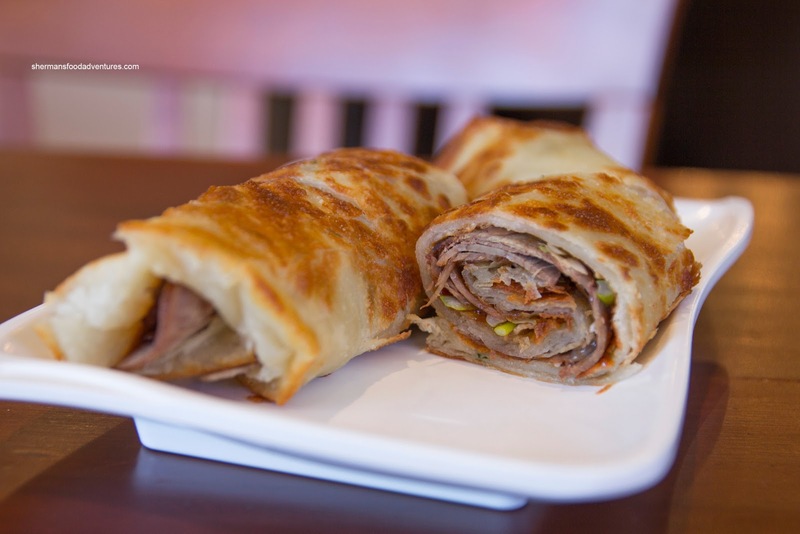 We decided to get some of their more famous items starting with the Beef Roll. For me, this is the best in town and they didn't let us down (hey that's poetic!). The pancake was light, crispy and only the slightest of greasiness. 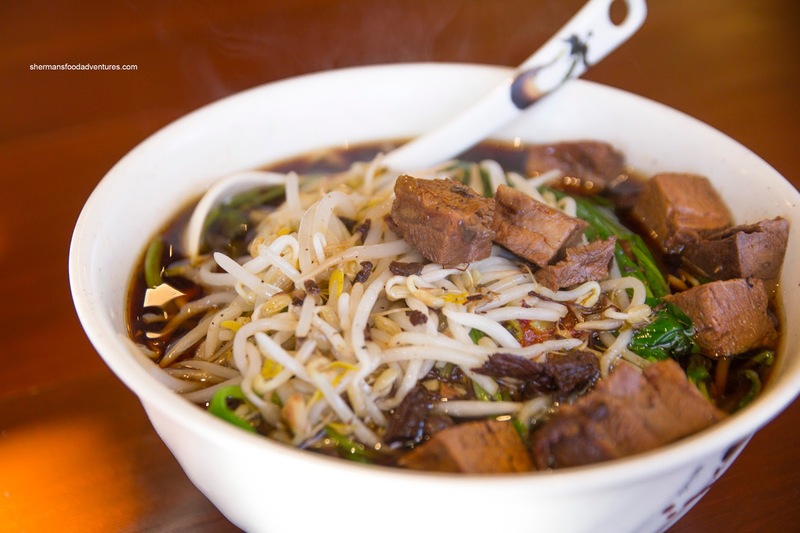 Inside, there were soft slices of beef shank which were accented by hoisin and scallions. 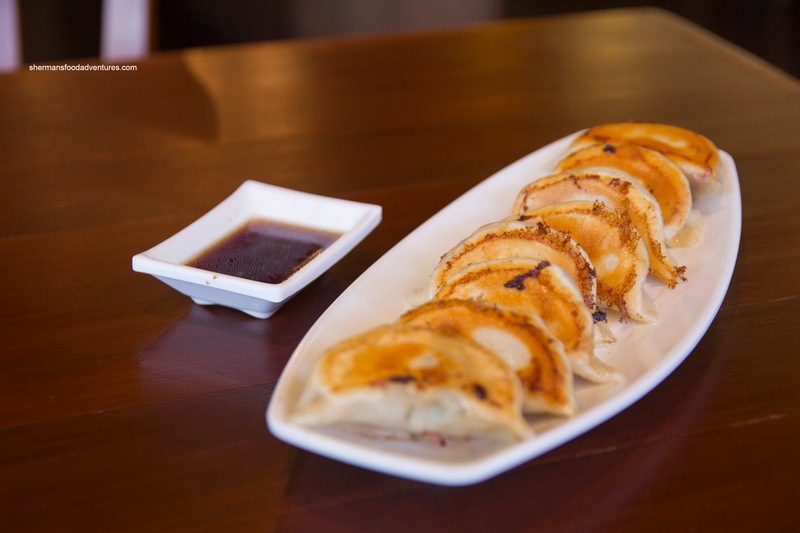 Next, we had the Pan Fried Dumplings (aka Potstickers) which were fried up nicely with a golden brown bottom which was crisp. The dumpling wrapper was neither too thick nor thin and was easy to eat. I liked the filling as it was moist, flavourful and had a good amount of greens. 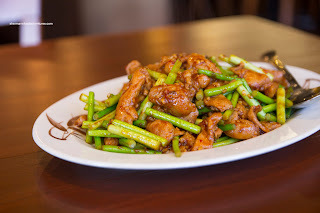 Something that caught my eye was the Spicy Pork and Garlic Stems which was really well-executed. The slices of pork were thick while super moist and tender (with just enough fat). Contrasting that texture was the crunchy garlic stems. All of it was caressed (no big pool at the bottom of the plate) in a savoury, garlicky and spicy sauce. 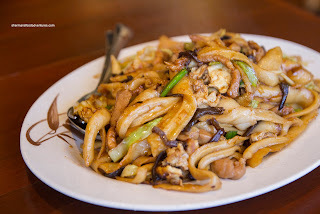 Of course we could not visit Peaceful without having a couple of noodle dishes (since they make them fresh on-site). We started with the Blade Cut Stir Fried Moo Shu Noodles. These were a touch soft yet still with some resistance. There was just enough sauce which was balanced between savoury and sweet. I liked the crunch of the wood ear mushrooms and the tender julienned pork. On the flip side, the egg was overseasoned. Lastly, we had the Szechuan Beef Noodles. The broth had some depth while being only mildly spicy. Loved the pickled vegetable as well as the accompanying bean sprouts and spinach (which added some interesting textures). However, the star of the dish was not the noodles, it was the beef. These cubes melted-in-our-mouths. It was as if they sous-vide it (but they didn't). The noodles were good as per usual. And as per usual, the food was solid on this visit to the new location of Peaceful. Loved the copious amount of free parking too. Great review. OK, I really need to ask. WHAT ON EARTH WENT DOWN WITH "NEW PEACE" (former "Peaceful Restaurant) ON DAVIE? Sorry, but I live near the former Peaceful on Davie/Seymour area and it was a complete mindf*ck when they closed down for two months for "renovations" then re-opened again with absolutely NOTHING renovated, minus a shattered "Peaceful" sign. We went in there eagerly again, the food was god-awful atrocious, the staff was rude, and we started calling it the "Chaos Restaurant" for awhile and went the extra mile to Peaceful on Broadway for awhile until something forced us back to New Peace and we found the flavour was a lot better. But the menu items were still eerily similar to Peaceful so I wondered if there was any affiliation. Then went out that whole press release (like 8 months late) that actually New Peace and Peaceful are not affiliated. What on earth happened there? A hostile takeover? Just so you guys know, there'll be a new Peaceful at 5th & Ontario, as well as in Kits sometime this month. Wow that was my senior's moment ....... LOL !! !